Editor's Note: Former President Carter’s remarks on racism continued to resonate with Thursday’s American Morning audience. The majority were in agreement with Mr. Carter’s assessment. Others objected, believing President Obama’s policies were at fault; and blacks, not whites, were using the “race card,” rather than concentrating on the issues. Dorothy: The sad state of America is the fact of the disbelief and the realization that RACISM is a fact in the US. RACISM is alive and when you do your jobs and investigate RACISM. President Carter is correct. Douglas: I am a white male baby boomer that grew up in the deep south (Mobile), and presently live in North Carolina. I heard someone mention that former President Jimmy Carter was irrelevant. Not so! He hit the nail square on the head and for those to deny what he said as true are living in a world that is far removed from reality. I was a 'freedom fighter' and crossed race lines during the sixties to fight for civil rights, knowing that not only was I fighting against Jim Crowe, but also for future generations against bigotry, hatred and oppression and for equal rights for all. The vitriol that has continued no matter how subtle it may seem to have been is there in the back roads of minds of small minded, undereducated people. 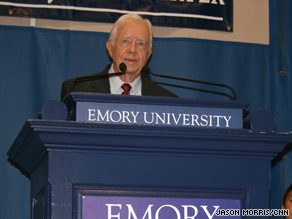 The fight continues against such issues; anyone who spouts a belief in GOD and continues to do such does not understand GOD's love for all and thank GOD for persons like Jimmy Carter for taking a stand and telling it in the bully pulpit that he has access to, as we out here who do fight daily against those attitudes know exactly what he means. He is not our black president (Obama); he is our president!! Take out references to color!! +thank you. Bahe: My comment is for the question regarding Pres Jimmy Carters statement RE racism. I think the president is right. Racism is "bubbling" to the top in politics and in the news media, i.e., Lou Dobbs, RushBo, etc. I am Native American. I have lived through racism. I know what it's like. President Carter also has lived in an environment of racism. When you are a part of it either as it's victim or live along side it, I think you can tell what it is. Pres Obama tries to deny it because I don't think he has lived in a racist area. Or has never been affected by it up till now. Maybe his upbringing by white mom and white grandparents shielded him from much hate. But now he's in the real world. And Joe Wilson just showed him up front and personal about racism. I don't care much for either party, but I can admit to what I see. It's Racism! Yvonne: It is NOT racism, it's the issues of Government control and the background and associations this President has! For Pete's Sake, just look at the issues and his background!!! Sharon: The only "racists" that I know are "black". THEY are the ones that keep playing the "race card". Many "whites" supported and voted for Obama. I even sang his praises in the beginning and made the statement that he could be the best president we have ever had. Then came the "czars" with their radical beliefs and agendas. Pelosi is brain dead. Obama is anti-American with his actions and agendas. Race has nothing to do with it. Government corruption, lies, deceit, and agendas has everything to do with Obama's falling popularity. We no longer trust or can believe that the White House has America's best interest at heart. I have never seen so much betrayal by an American administration nor "mainstream" media. Theresa: Mr. Carter and the rest who are promoting the racism card are off base, & are making fools of themselves & are creating division. Assuming the worst because of a few idiots makes a fool out of those who say this. I am insulted by such statements and views. I disagree with Pres. Obama's policies: abortion, immigration, health care take over, Medicare reduction of services. He is the most liberal person ever elected and his Senate record is more liberal (progressive) than Kennedy. I felt the same way with the previous Dem that ran for President if these were their policies. I would not vote for Ted Kennedy for the same reason. Does that make me prejudiced against Catholics? Oh, I am one. My daughter is the same race as Obama what difference does that make. It isn’t just Carter it is the media who keep raising this "possibility" to see if it has legs. YOU are supposed to be critical of the powers that be.. You had no problem with Bush why can't you investigate, check out and "pretend" that you are objective! Is there anyone there that can be an Edward R Morrow???? Who’s right in this debate? Is there a possibility that BOTH sides could be correct in their assessments on race? 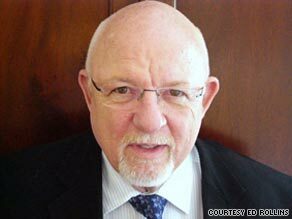 Ed Rollins says opposition to health care reform is about the substance, not the president's race. NEW YORK (CNN) - President Obama is about to undertake a full-scale blitz of all the Sunday talk shows to try to convince the American people one more time of the merits of his health care plan. This is after he has spoken on the subject publicly more than 100 times and after he just gave a nationwide speech before the Congress and the country. I know this is his highest priority, but what else can he say to turn around the nearly half the country that doesn't want his health care plan? And if he told us honestly that the plan he and the Democrats are proposing could cost you more and cut services for those on Medicare, even more people would be opposed. This is now an inside game. There are House versions and a Senate version of the reform bill. It's a question of how do you get them passed and get them to a conference committee to work out the differences. ATLANTA, Georgia (CNN) - Former President Jimmy Carter reiterated Wednesday that he believes racism is an issue for President Obama in trying to lead the country. WASHINGTON (CNN) - The community organizing group ACORN on Wednesday announced a hiring freeze, new training programs and an independent review of its programs after the recent release of a series of videotapes embarrassing to the agency. In the videos, the individuals seek advice on setting up a brothel with underage women from El Salvador. The videos, secretly taped by two individuals posing as a pimp and a prostitute, showed ACORN employees in four of the agency's offices suggesting or condoning a series of illicit actions as the couple sought advice on setting up a brothel with underage women from El Salvador. "We have all been deeply disturbed by what we've seen in some of these videos," ACORN CEO Bertha Lewis said. "I must say on behalf of ACORN's board and our Advisory Council that we will go to whatever lengths necessary to re-establish the public trust."